The dress is by my favorite current designer, Byron Lars. His exquisitely detailed and unique pieces from his Byron Lars Beauty Mark line are available in Indiana only at local Indianapolis boutique, Enza's. Anthropologie also carries a few pieces from a secondary line. 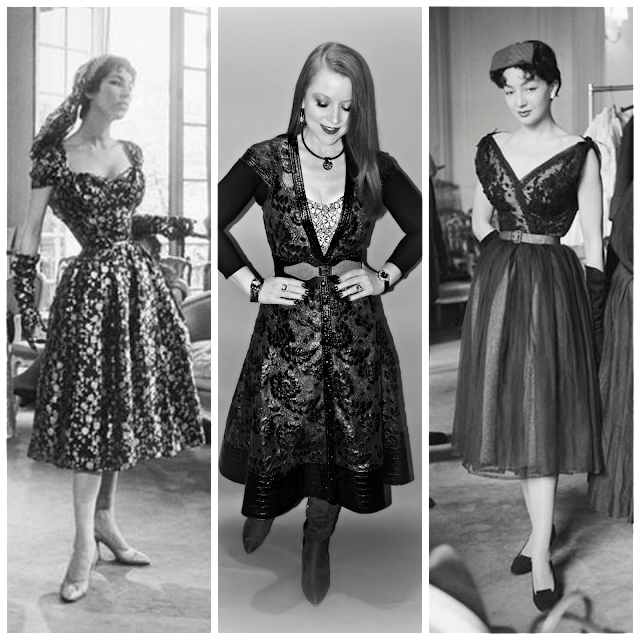 Solely from a fashion perspective, I often think I was born in the wrong era. The late 40s and 50s embody the design aesthetic that most appeals to my personal sense of style. 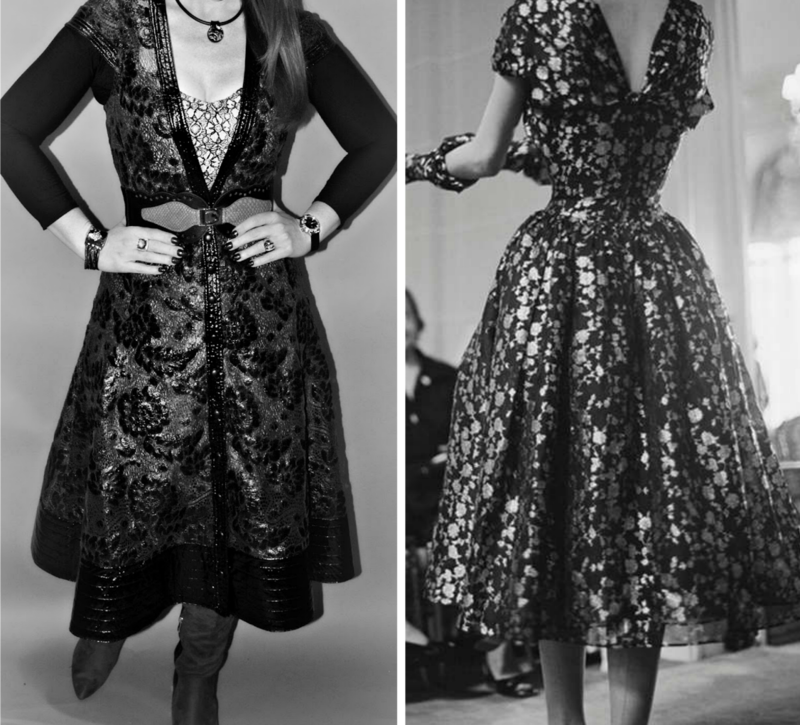 In particular, I have and will always love the revolutionary post-war silhouette introduced to the world by Christian Dior in 1947 and immediately dubbed the "New Look." The dresses to my right and left are vintage Christian Dior couture from his 1953 collection; My own, updated version of the New Look is contemporary designer Byron Lars' reinterpretation of the iconic silhouette in modern fabrics with an edge. 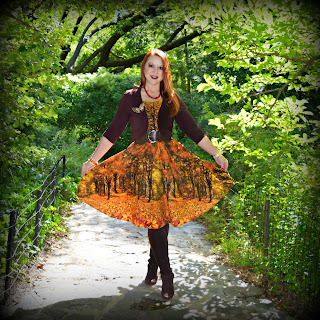 It's feminine but modest; dressy but not restricting; demure but statement-making. It's also figure flattering to the those of us who embody certain lyrics of a well-known Sir Mix-a-lot song. 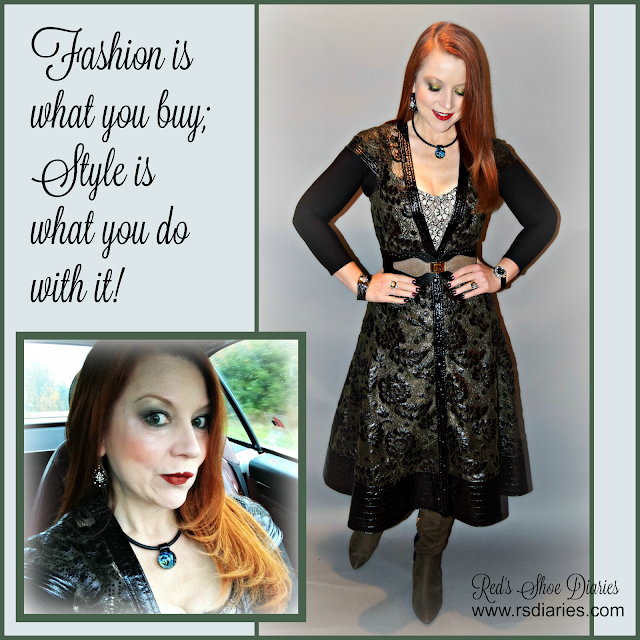 It's a style that will remain part of my wardrobe regardless of what's coming down the runway in any given Season. Luckily, as avant garde as the silhouette was when Dior revealed it to the mid-century masses, it's become a timeless classic, reinvented over the decades in new fabrics and by new designers so that it maintains a modern edge despite a vintage pedigree. These boots from Diba are exceptionally comfortable and are currently available through Amazon for just $25! Byron Lars, one of my favorite modern day designers, excels at reinterpreting classic shapes with new fabrics and novel twists. This dress is a perfect example. Despite the voluminous skirt and floral pattern, there's no mistaking a piece rendered in shiny waxed leather and lace for a vintage frock. The materials are thoroughly modern, and the olive green and black color-scheme lend an edge that keeps it from looking overly "girly." Yet, there's also no denying the historic "New Look" influence, either. The 1953 Dior dress on the right features a metallic floral pattern, which was very modern for the time; what's old is a "new look" all over again in waxed floral lace by Byron Lars on the left. 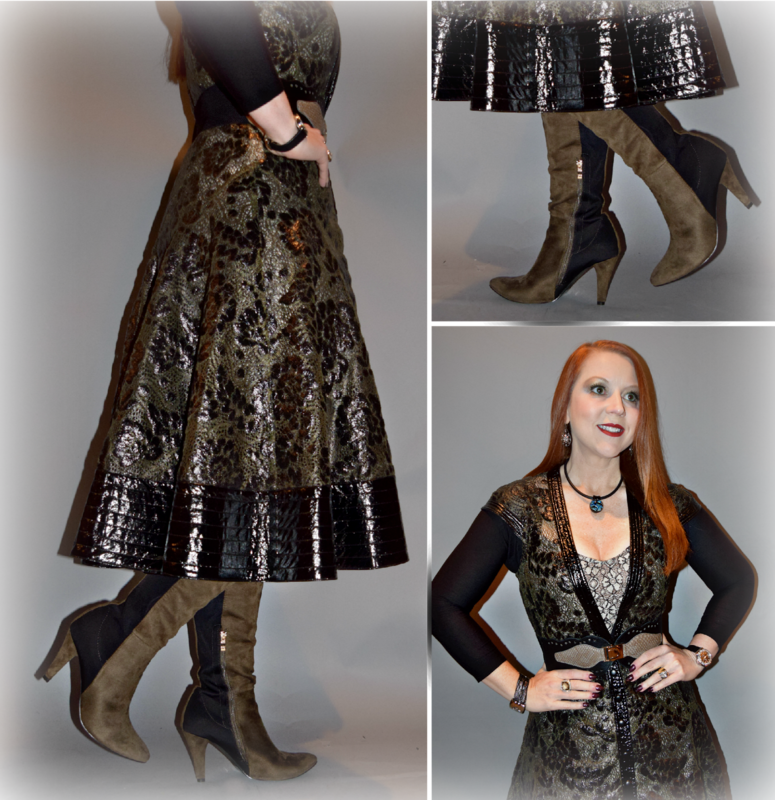 In keeping with the modern approach (keeping the old "New Look" new, if you will), I paired the dress with two-tone knee high boots that are a better balance for the weighty fabrics than the demure pumps Dior might have selected back in the day. I also added a thin, 3/4 sleeve top underneath for the sake of warmth and coverage without covering up the detail of the bodice. May the New Look always be new! I switched out a black, waxed leather tie belt that came with the dress for a wider, snakeskin print belt from Amazon. 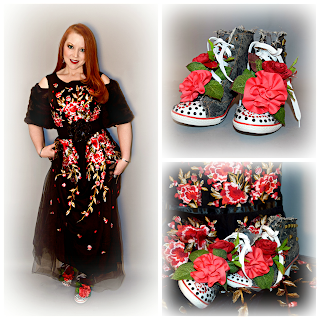 Chunky, dark metal jewelry and a large Tag Heuer watch better suit the fabric and color of this dress than delicate pieces would; the black "undershirt" is by Sleevey Wonders.